Athletic activity pushes your body to its limits. You pivot, sprint, stop fast, push harder, and do it all over again. Sometimes a wrong step, a sudden impact, or too much of a certain activity can result in a sports injury. Every athlete dreads sports injuries, but if you know what to expect and are prepared to help your body heal, you can get back in the game faster. Different types of sports come with different risks, but there are some common injuries that almost every athlete has experienced at one point or another. Whether it is in your hamstrings, calf, quadriceps, groin, or shoulder, a pulled muscle can slow you down. Also known as a muscle strain, a pulled muscle happens when you overstretch (and sometimes tear) a muscle. It can happen from overuse, not warming up properly, or moving the muscle in a way that it does not typically move. 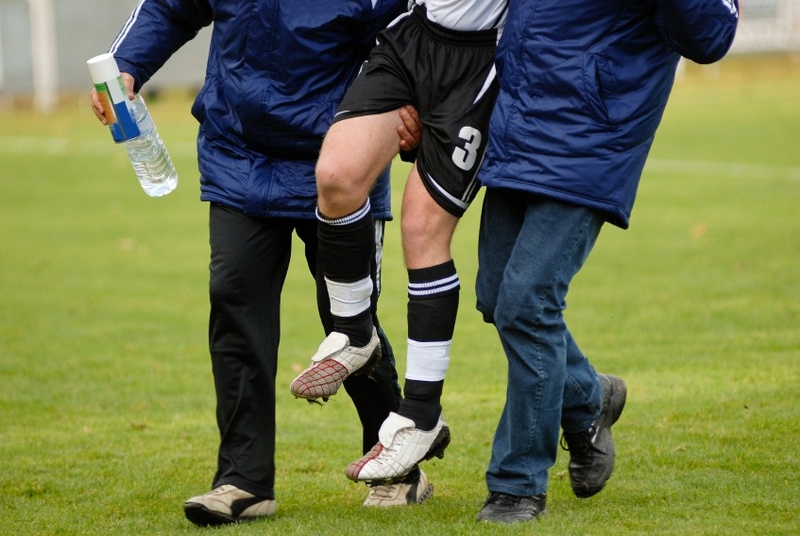 If your sport requires being on your feet, you have probably sprained an ankle at some point. An ankle sprain occurs when you roll or twist the joint awkwardly. Inside the joint, the ligaments are forced to stretch, sometimes to the point of tearing. There are several ways you can injure your knee during athletic activity, including a torn ACL, MCL, or meniscus. Like many other sports injuries, damage to the knee often occurs when your body moves in a way that it shouldn’t. The knee joint is designed to move in only two directions; when it’s forced to move in other ways, either from an impact to the side or by pivoting and twisting, the tissues inside become damaged. Pain along the shin bone can be caused from overuse, not stretching before and after activity, over-pronation, or trying to do more than your body has trained for. This type of injury is most common in sports that require a lot of running or jumping, which over time creates microtears in the muscles surrounding the shin bone. Shoulder injuries commonly occur in athletes who throw a ball, swing a bat or racquet, or swim. Repetitive motions can cause inflammation in the joint, which if not treated, can lead to more serious sports injuries like bursitis or damage to the rotator cuff. An extreme sports injury might require surgery, but often these common sports injuries can be treated with rest, ice, compression, and elevation. Physical therapy is also recommended to help regain strength, flexibility, and range of motion. These two simple tips are too often ignored, especially by athletes who want to push through the pain and get back in the game. Resting the injured area for the appropriate amount of time, which can sometimes be weeks and not days, is crucial for achieving a full recovery. If you return to activity too quickly after an injury, you risk further damage and a potentially much longer recovery. You only have one body -- take care of it and get adequate rest after an injury. Elevating the injured area helps reduce swelling by limiting the ability of excess fluids to flow to the area. It doesn’t take much effort and gravity does all of the work for you. Cold therapy is proven to help damaged tissues heal faster. Combining cold therapy with compression produces even better results. You can use ice packs, gel packs or ice baths to deliver cold, and elastic bandages for compression. You can also use a cold therapy machine to deliver therapeutic cold and active compression at the same time. This is an excellent option if you are looking for a convenient, effective treatment method during your recovery. After an injury, physical therapy helps you regain range of motion and builds strength and flexibility in the surrounding muscles. In addition to helping you recover faster, physical therapy can also help prevent future injuries. Many athletes struggle with trying to do too much too soon, so follow your therapist’s recommendations, even if you think you can do more. Sports injuries are an unfortunate part of being an athlete. When they happen, start cold and compression treatment as soon as possible to reduce pain and inflammation. If you want to take your recovery to the next level and heal even more quickly, talk to your trainer or physical therapist about using a Game Ready cold therapy machine.